Leigh, Look's like a yellow finch. Leigh....what I love the most is that you took note of the exhilirating feeling of that tiny creature leaving your hands and taking flight. Makes me think of how many really amazing litte experiences fill our days, if only we are tuned in enough to notice. I know nothing about birds, but I'll ask my host sister in Salta. Maybe it's well known locally. 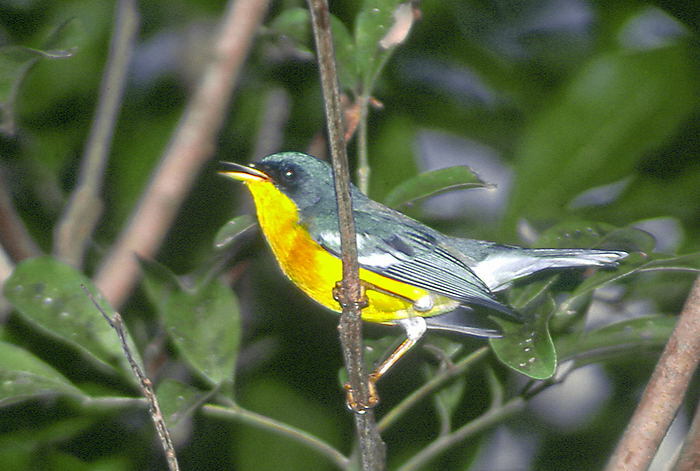 I think that this bird is the one called in spanish Pitiayumi (Parula pitiayumi). Best site in the whole-wide world for ID on birds and lotsa other critters. Just make sure you tell them the bird squinched down and you didn't squinch it. Some really serious birders (they call themselves). I suppose renting Hitchcock's "The Birds"
Classic movie, but it scared the hell out of me. I'm still getting over the fact that you said, "squinched". It's like finding another person who speaks my language. My husband once caught a bird in the same way using a tea towel and he described it similarly. The sudden feeling that you are in total control over what happens to this tiny little life as he looks at you eye to eye and then, whooosh! I think I'd take butterflies over birds any day. Funny how some people are also afraid of butterflies landing on them too. Anyhow, you got some pretty pictures and a great story. It is really beautiful. I can't believe it was looking right at me. I think Horacio down below has the correct bird. I wonder, though, if it's related to the finch. The body type is so similar. Just the coloring is different. You know, I had you in mind when I wrote this. I had a feeling you would know. I wish you had been here to see it for yourself. I was standing so close to the little one. Thanks for the link, Mike. Great site. I love how between you and Horacio, there's a bit of a bird watchers resource going on here. And if I had squinched the bird, I would have been seriously traumatized. No way I could have written about it. J. Hitchcock's Birds absolutely terrifies me. I have only seen it a couple times, and that was quite a while ago. But I still shudder when I think of that scene when they're leaving town and there are birds absolutely everywhere. In a way, I'm the perfect audience for the movie, bc I'm already scared of the creatures. Less, so, though, after this. In the kitchen? Most definitely. I've become accustomed to all sorts of animals and insects since moving into this place. We went to a butterfly farm in Costa Rica when we were living in Panama. And yes, we saw plenty of people freaking out because of the butterflies. Yet those same people had no fear of feeding or petting the monkeys they had there. Even though, we were warned not to go near the monkeys because they're actually dangerous. So funny you say that. When I posted the butterfly photo, I thought to myself something along the lines of "Man, our windows look really quite filthy." But then I figured there's honesty in that. Because I don't really see myself cleaning the windows anytime soon. Yes, and now you have given me the perfect reason why. I was actually amazed at how mellow this bird was. He went a bit crazy at first, but then got all calm. I think we have to figure out how they're getting into the house. It's too many to be just a coincidence. That was most definitely the defining moment for me. Along with the weirdness of all the animals and birds that seem to find their way in our kitchen. I'd love to know what your host sister has to say about the bird. Around here, almost everything has a story to it, as well. "It's a Tweety Bird" - Sylvester the Cat.